"The Amish have traditionally maintained a scale of farming that enabled each farm to be worked by a family. Few farms have more than eighty tillable acres, which is about the maximum a father and son can easily work. If more help becomes available the operation may be expanded to include more livestock or possibly specialty crops such as vegetables. Rarely are more acres added." There are many Amish families in and around Knox County. 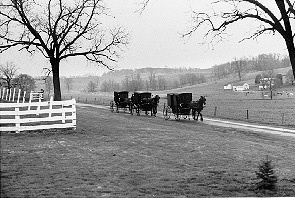 Holmes County, which borders Knox County to the northeast, is home to the largest population of Amish in the world. You may often see horse-drawn buggies traveling through this part of Ohio, and, if you look closely at the farmers in the fields, you may even witness farming done the "old-fashioned" way by the Amish. How do the Amish farm? Many of the Amish who populate this area brought with them the farming skills passed down by their ancestors who founded their Swiss Anabaptist heritage in Switzerland and Germany nearly three-hundred years ago. In order to keep their religious, family and community values, the Amish have chosen to do without some of the technology that other farmers use. For instance, they often use horses to plant and plow their fields instead of tractors and combines. Many Amish also avoid using pesticides. Instead, many Amish famers use manure to fertilize the land. They also use crop rotation to keep the soil healthy. The Amish work to combine their knowledge of science, technology and experience to maintain their traditional way of farming. This type of farming benefits the families and the community. Here are questions which challenge you to think more about Amish farming! What are the costs that an Old Order Amish family has to run their farm? What costs do a family farm with a tractor and a combine have for their farm? Write a one-page essay on the similarities and differences between farming with satellite technology and Amish farming. How would the technological differences affect farm life? How many people are needed to farm on each of the farms? Do you think there are differences in the amount each family can farm with their different technologies? The Amish avoid owning some conveniences that many of us use daily like cars and telephones. Imagine how your daily routine would change if you could not use these conveniences. From what you have already learned about farming, how would a farm family's activities and lifestyle change if they began to farm like the Amish?